Before there were cars, America’s country roads were unpaved, and they were abysmal. Back then, roads were so unreliable for travelers that most state maps didn’t even show them. This all started to change when early cyclists came together to transform some U.S. travel routes, and lay the groundwork for the interstate highways we use today. Through the 1880s, spring and fall rains routinely turned dirt lanes into impassable mud pits that brought rural life to a standstill, stranding farmers at home with their produce and leaving grocers’ shelves bare. In the summer, the roads bore deep, sunbaked ruts; in the winter, treacherous ice slicks. The nearby farmers who were responsible for maintaining these roads didn’t have the means or desire to pave them, or even to post signs identifying them. But the same ravaged paths that seemed primitive to foreigners like Kipling were normal for Americans. And they might have stayed that way if it hadn’t been for bicycles, and cyclists who banded together to lobby for government funding of better roads. The first bicycle, called a “pedal velocipede,” was patented in 1866, and its heavy wood-spoked wheels were no match for America’s rough roadways. By the late 1870s, though, builders had started making wheels with lightweight wire spokes under tension. This technique, still seen in modern bicycle wheels, allowed makers to enlarge the front driving wheel so that the bike would go farther with each crank of the pedals. Bikes took on the penny-farthing silhouette: a chest-high front wheel and a knee-high rear wheel. This design made cycles faster and more roadworthy, since the tall wheels’ gentle arcs rolled right over smaller holes in the road. Cyclists, however, could speak— and organize. Since high-wheel bicycles cost many times the average tradesman’s weekly wages, they were affordable only to the well-to-do, and the first bicycle clubs were upper-crusty fraternities for racing and socializing. The groups quickly developed a political agenda, as cyclists had to fight for the right to ride. Police routinely stopped riders and shooed them off city streets, inspiring cyclists to join together and press for access to public thoroughfares. A national coalition of clubs called the League of American Wheelmen (LAW) came to lead these efforts. 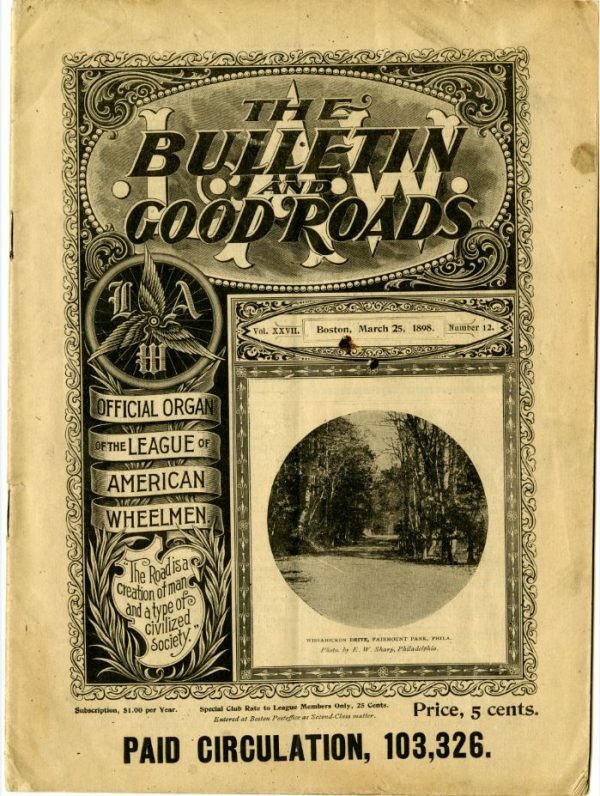 A cover of Good Roads magazine. Early court cases went against bikers. In 1881, three cyclists who defied a ban on riding in New York’s Central Park were jailed. But the cyclists eventually prevailed, and in 1890, the landmark Kansas case Swift v. Topeka established bicycles as vehicles with the same road rights as any other conveyance. By then, the bicycle had undergone another transformation. Makers had discovered that, by using a chain and sprockets, they could make a wheel rotate more than once with each turn of the pedals. Wheels got smaller again, seats got closer to the ground, and the so-called “safety bicycle” — cushioned by new, air-filled tires — started selling like mad. 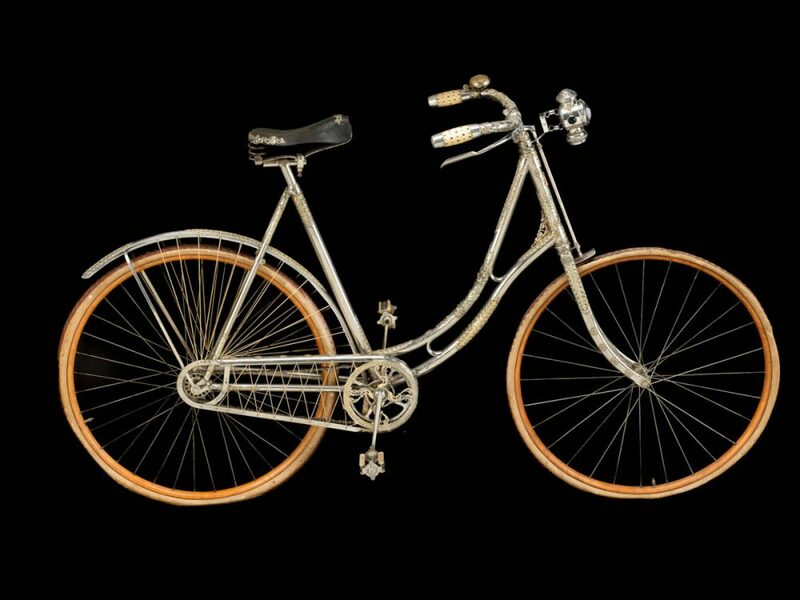 A safety bicycle looked pretty much like a modern commuter bike, and by the early 1890s, more than a million Americans were riding them. With that many cyclists on the road, the demand for smoother roadways began to go mainstream. Farmers weren’t on board yet, though. If better roads meant more unpaid work for them, most preferred the status quo. But then cyclists launched a full-bore PR campaign, one of the first of the modern era. Both in books and in a new monthly magazine called Good Roads, the LAW made the case to farmers in pocketbook terms. Because pulling loaded wagons through muck or over ruts required extra horsepower, American farmers owned and fed at least two million more horses than they would need if the roads were smooth, LAW official Isaac B. Potter informed his rural reader. “A bad road is really the most expensive thing in your agricultural outfit,” he wrote. Potter argued that farmers deserved a cut of their urban countrymen’s taxes to pay for road paving. Many farmers were convinced, and began to work with cyclists to lobby state and local governments for better roads. In mid-1892, Colonel Albert A. Pope, a leading bicycle manufacturer, printed thousands of copies of a petition demanding that Congress create a federal department to promote “knowledge in the art of constructing and maintaining roads.” He enlisted cyclists’ help to collect signatures and return signed copies, which he pasted into an enormous scroll. Pope delivered this scroll to the U.S. Capitol in 1893, displaying it on a pair of hand-cranked oak spools that stood seven feet high. The so-called “monster petition,” now housed in the National Archives, bore 150,000 signatures. That same year, Congress authorized the creation of the Office of Road Inquiry, a two-man fact-finding operation that was a precursor to the Federal Highway Administration. In 1896, the U.S. Postal Service further boosted rural support for good roads by launching the first rural free delivery routes. Rather than having to trek miles over iffy roads to the nearest post office to check for mail, farmers could now receive the same daily drop-off service as city residents. The catch was that the postmaster would authorize home delivery only if the local roads were passable, a strong incentive for farmers to see that they were. As roads improved, city-dwellers increasingly used bikes to explore the flyover country of their day: the terra incognita between railroad stations. Wayside inns that had averaged one guest a week for years were suddenly overrun with wheelmen, some of whom installed signposts and created road maps to help other cyclists find their way. This didn’t last long, though. By the end of the 1890s, the bicycle boom had collapsed, and fashionable swells had moved on to other passions. Working people in cities still used bikes for commuting or making deliveries, but the touring fad and the power of the bicycle lobby were done. Nevertheless, when automobile tourists took to the roads in large numbers in the 1910s and 1920s, they often found the way marked, mapped, and paved by cyclists who had come before. 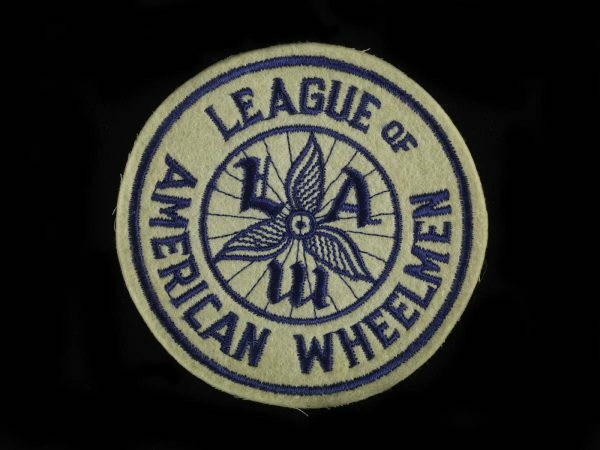 A promotional patch from the League of American Wheelmen. The bicycle, meanwhile, was largely erased from America’s roadways. Painted, car-width lanes seemed to leave no space for cycles. The new practice of parking private vehicles along the edges of public roads crowded bikes out of that space. Postwar suburbs separated housing from workplaces by long distances, making bicycle commuting impractical. Late-century exurbs, with their cul-de-sacs and collector roads, maximized driving speeds within developments, which added to the danger of cycling there. Interstate highways, for which early cyclists are partly responsible, are almost all closed to cyclists. Now comes a new call for road space for bikes. In the past 10 years, as middle-class Americans have moved back to urban cores—where shorter travel distances make cycling more practical—riders have pressed governments for safer bike routes. And governments have begun to deliver. In the 50 most populous cities, the average mileage of on-street bicycle lanes has doubled since 2007, while nationwide, the number of physically separated bike lanes has more than tripled since 2011, with many more miles in the works. Some drivers bemoan the loss of asphalt. Much like farmers of the 1880s, they prefer the imperfect status quo to changes they perceive as serving a small, self-regarding elite at their expense. And, much like good-roads lobbyists of the 1880s, it falls upon bicycle advocates to make the case that facilities for cyclists are worth the cost, not only in construction (which tends to be cheap) but also in lost access to part of an existing roadway for driving and parking. There are strong arguments being made here. More and better bike lanes have been shown to smooth traffic flow and diminish deadly collisions between bikes and cars. They can also help clear the air, reduce the demand for downtown parking, and improve public health by encouraging exercise. But to judge by the furious responses that usually erupt when plans for a new bike lane are announced, those arguments haven’t convinced everyone. Bicycle advocates are already following the historical example of the League of American Wheelmen by banding together in advocacy groups such as the League of American Bicyclists, a gender-neutral revival of the old organization. Isaac Potter might advise bike lane supporters to seek common cause with their most vocal opponents, stressing the money and time saved for drivers when all road users are safely accommodated. Another thing Potter might say is that the future is fickle. We may do our best to shape roads that work for all current users, only to find we’ve paved the way for some new mode of transport that is beyond our imagining. Margaret Guroff is the author of The Mechanical Horse: How the Bicycle Reshaped American Life (2016), from which this essay is adapted. 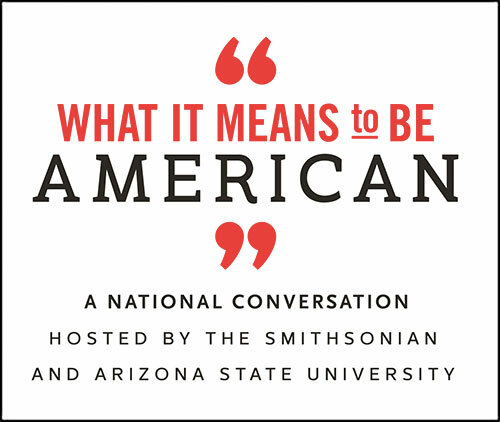 This essay is part of What It Means to Be American, a project of the Smithsonian’s National Museum of American History and Arizona State University, produced by Zócalo Public Square. Buy the Book: Skylight Books, Powell's Books, Amazon. Primary Editor: Louis Patterson. Secondary Editor: Eryn Brown. *Lead image and second interior image courtesy of National Museum of American History Teaching Collection. First interior image courtesy of Warshaw Collection of Business Americana, Archives Center, National Museum of American History.